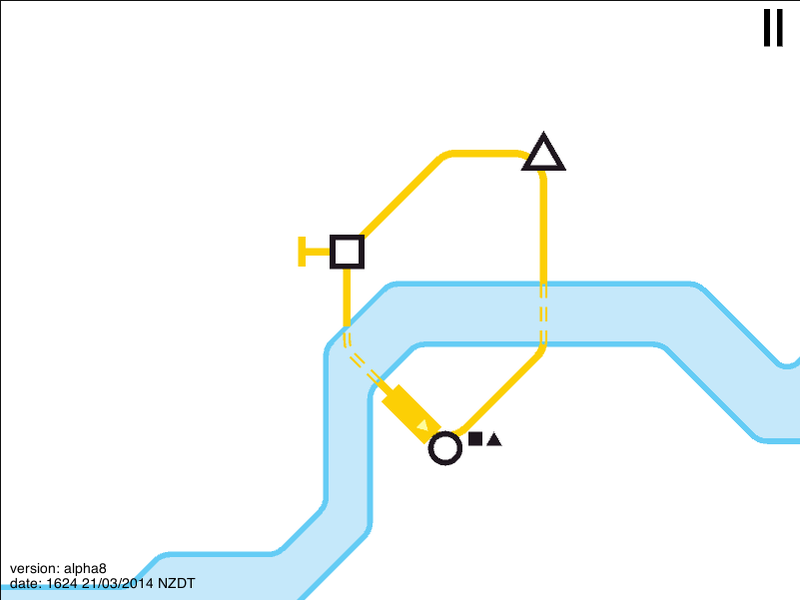 Mini Metro is a little game I found online. It's currently a free flash game, but it's been greenlit for Steam (which, for those who don't know, is essentially an online game store that a lot of people - including myself - use). Basically, you start out with three stations. You can click and drag with the mouse to build a line between them. As soon as you do, commuters will begin to use your line. The game is currently set in London, but there will be more maps (including New York and Paris), in the full release. The map does look a lot like London, with a geometric Thames running through the middle. You start out each game with three tunnels, used for crossing the river. If you decide to build a circle for the first three stations, you'll probably end up having to use two of them. A simple circle to start out the game. 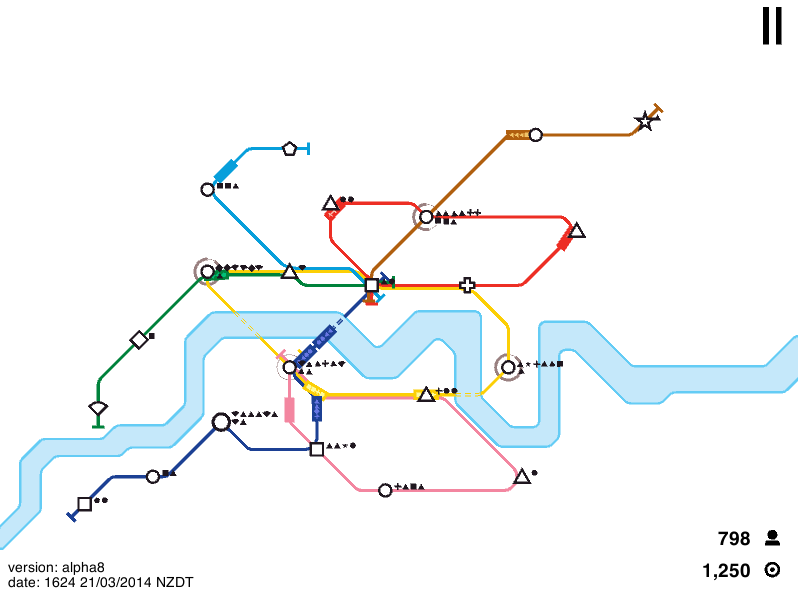 All of the line colors (you can have up to seven) for this map are based on real Tube lines. The colors will apparently change depending on what map you're playing on. But soon more stations start to pop up. The three main ones are circles, triangles, and squares - the circles appear the most, the squares appear the least - and commuters are represented by these shapes, telling you where they want to go. They're not picky, so they'll go to any station so long as it's the shape they want to go to. As your system grows (the game subtlely zooms out as you go along), new types of stations come up that only appear once - these can be annoying, as it can crowd the line servicing the one station. You can connect to new stations either by extending lines (by clicking and dragging from their termini), or by building new ones. You start out each game with three railcars (each one holds four commuters), one of which is used for the first line. You can either use railcars to build new lines to connect to more stations, or you can use them to add more trains to existing lines (by default, new lines only have one train). This adds a bit of strategy - new line, or upgrade existing line? Once you've transported 25 passengers safely, which doesn't take too long, a "Budget Increase" menu comes up. You can choose between three upgrades for your system: an extra railcar, another tunnel, or a station upgrade, which can be dragged onto a station for extra capacity (more on that later). I find railcars to be the most useful, and end up choosing them every time, but that's just my strategy. 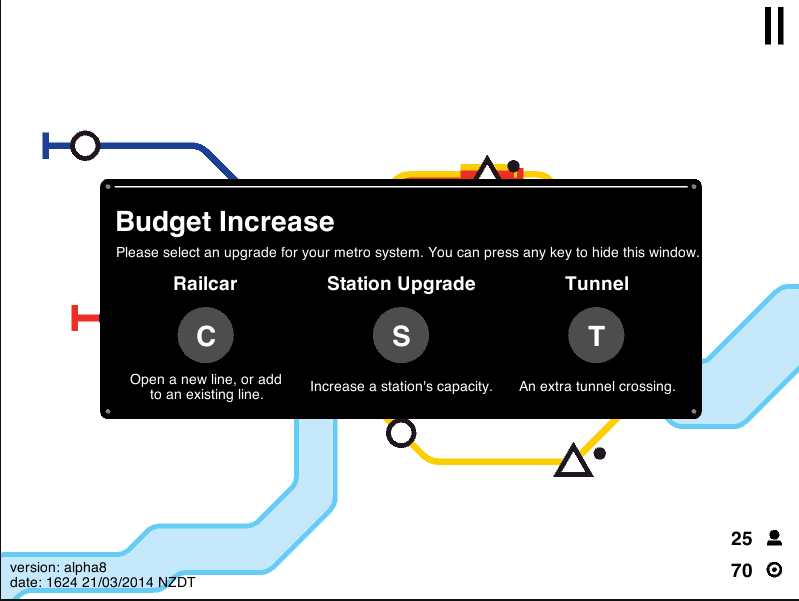 Budget increases happen when you reach certain amounts of passengers. You can also hide the menu if you need to. So this sounds like a nice, casual game, right? Wrong. Because if a station has more than six people waiting at it, a circle appears around it that starts ticking down. 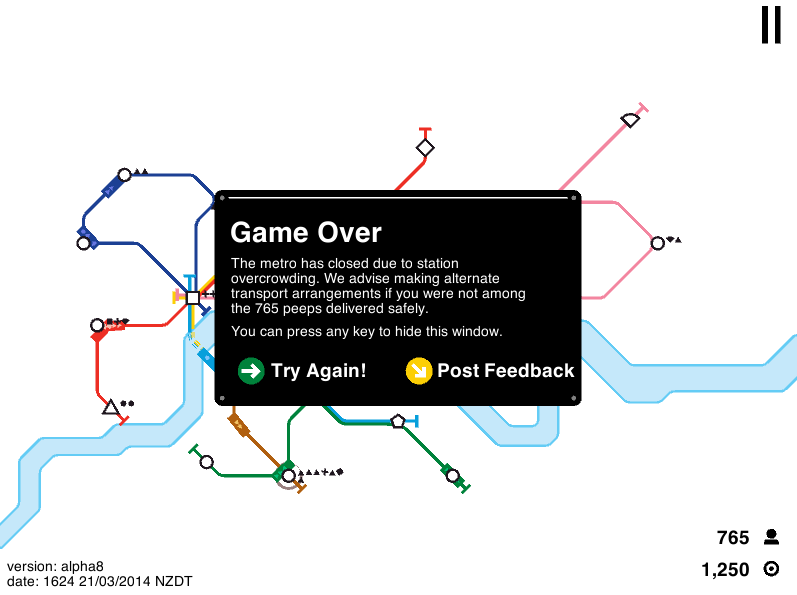 If it gets to nothing, it's game over, and the number of passengers you transported is your score. Not so easy now, is it? And actually, the game is really hard! My record is 798, but I've seen people online with 1500 or 1600. This is my record. You can see that the system's full of overcrowded stations. The third station on the Blue Line (Piccadilly in London), incidentally, is an upgraded station. All of the examples with over a thousand are entirely circle lines. And I know that circles are more efficient, but I feel like in real life the system wouldn't be all circles. So I personally like to have realism over circles, but circles will get you a higher score (you can see in the above photo that I have three). Another good tip that relies more on luck is to make sure your stations are diverse. For example, let's say you have a line branching off from another that's all circles. This means that the line will only pick up people at the stops, then drop them off at the interchange. This will make the interchange overcrowded, and possibly lose you the game, although it's not like you can choose what kind of stations come up. And finally, I like to use my last line as a sort of a shuttle bus. If a station is overcrowded, I just draw a line between it and where the people want to go, then get rid of it once they're dropped off. It's sort of straddling the line between fair and cheating, but I do it anyway. So close to beating my record! I just wanted to show you the game over screen, as I had hidden it in the last picture. Pros: This is an amazingly addictive little game that can also be really devious. I absolutely love it! Cons: My only real issue is that although the little (computer) mouse showing you how to add railcars to lines is nice at first, it can get annoying when you see it for the 3,000th time. Also, when the game gets released on Steam you'll have to pay for it, but I don't really care about that. Sounds like fun, and challenging. Do you have a link to it? Oh, I thought I had put it in there! Now it's just before the pros/cons section.